"Our hearts grow tender with childhood memories and love of kindred, and we are better throughout the year for having, in spirit, become a child again at Christmas-time" - Laura Ingalls Wilder. Within this joyous month of December we get to enjoy the company of some of the most exciting and happy times of the whole year all wrapped up into one month. The build up to Christmas including houses filling with the sweet smell of Christmas treats cooking in the oven, getting in the spirit of Christmas through classic melodies (one of my favourites being 'I wish it could be Christmas every day' by Wizzard), gathering with family and friends, sharing memories of past christmases between young and old, and the tradition of putting up the Christmas tree and decorating the house, whether your a minimalist or go way over the top with tinsel and all things green and red like me. And once that's all over we get to look back and appreciate the year past and how we have changed, before celebrating new starts with the beginning of a new year. December is definitely my favourite month of the year. I am so appreciative of how good my life is and how lucky I am to have so many lovely people around me. However, it also makes me think of all those people who aren't as fortunate as me, and keep them in mind throughout this festive time. I'd love to know what your favourite part of December is and if you have any traditions so please comment them down below. To all of you who are reading this, I wish you a merry Christmas, a happy new year, and all the joy in the world for this special time of year. I have just recently returned back to Australia from an amazing holiday in the UK. And all I can say is I am jealous of the amazing variety of things you have over there. Clothing, makeup, cosmetics, and food is ridiculous. You can only imagine how crazy I went in the shops over there. I thought I'd share with you some of the things I managed to squeeze into my suitcase to bring back here to Australia. I thought I'd keep the clothing out of this post as its a bit excessive. Now I love chocolate. And I have discovered the chocolate we get over here in Australia is a massive disappointment when compared to those I have tried in the UK. 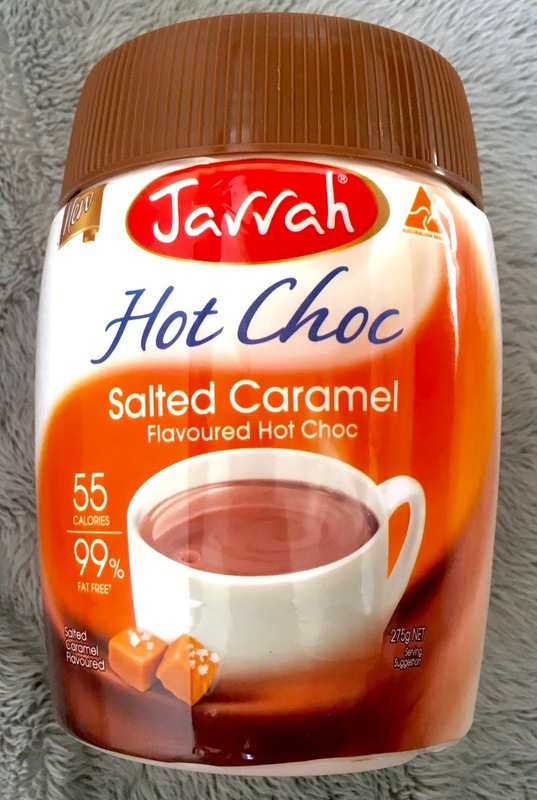 I think it's something to do with the heat, they have to put extra ingredients in the chocolate to stop it from melting which obvious inhibits the flavour. But luckily for those people in cooler countries (eg. England) get the natural good stuff. They also seem to not want to share some of your delicious chocolate brands with us unfortunate souls in Australia (Galaxy, get on that). So, yes, I made sure I ate a lot of chocolate whilst I was over there before being deprived on it again. But .... no one ever told me about the huge range of hot chocolate flavours! They have almost every flavour imaginable. I had to bring (quite a few) packets home. Unfortunately I am down to my last two packets. I don't know how I'm going to survive without their delicious, smooth flavour. 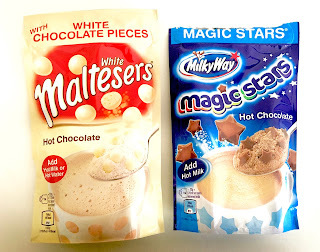 If your a hot chocolate or chocolate lover, like myself, I highly recommend anything from the UK. Ok, enough rambling on about my love of chocolate and on with the rest of the blog. 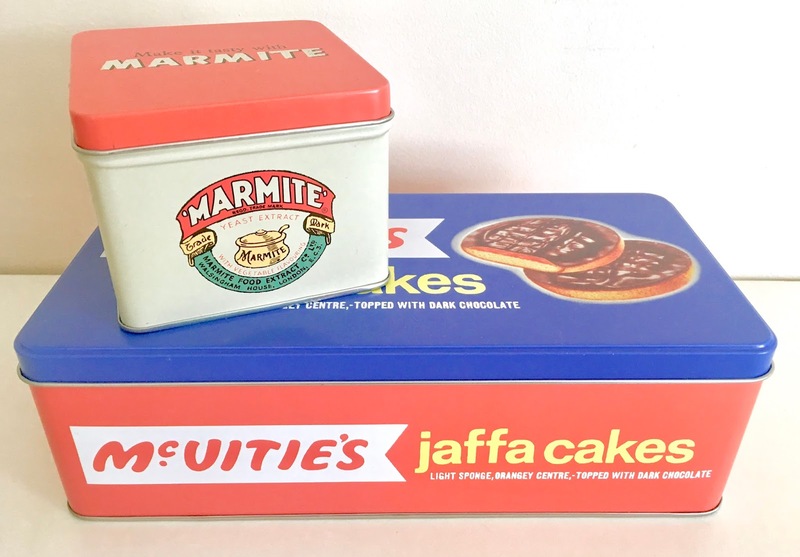 I am a lover of anything vintage, so when I saw these cute vintage tins I knew they had to come with me back to Australia. I wish I could have bought more but unfortunately I only had so much luggage space. 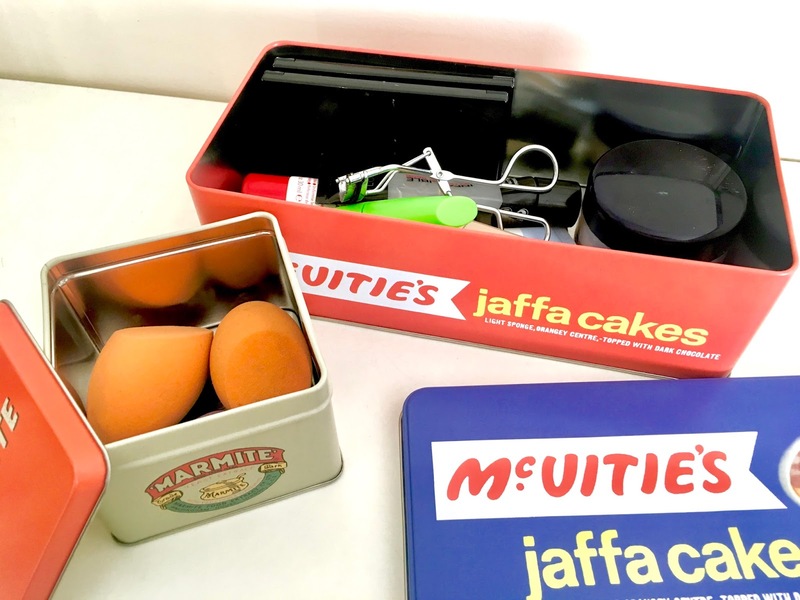 I use these to hold my everyday makeup and makeup sponges in, but they could be used for literally anything. 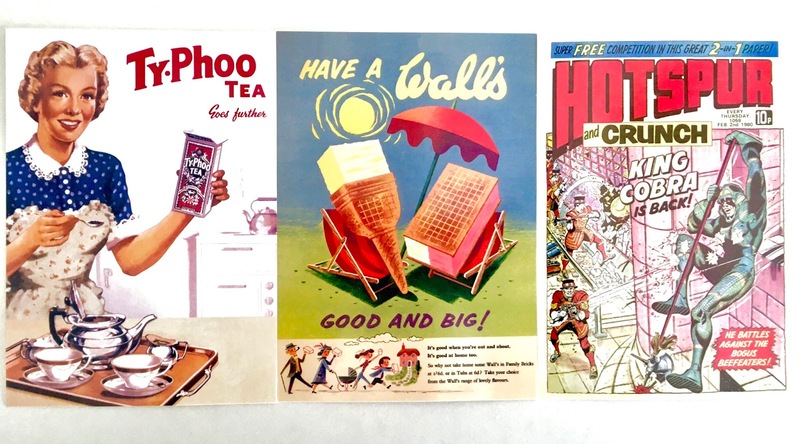 I also found some amazing vintage advertising wall signs like Coca Cola and Smarties, but I wasn't able to get them back home. If any of you love vintage stuff like myself I highly recommend the shop Dog and Bone in York, England. They sell old vintage clothes, accessories and home decor like the things mentioned above. But for those of us who don't live anywhere near York we are deprived once again. 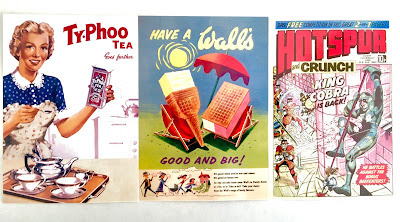 Also along the lines of vintage decor I also bought these lovely post card from the York Castle Museum. I am planning to hang in my room somewhere. 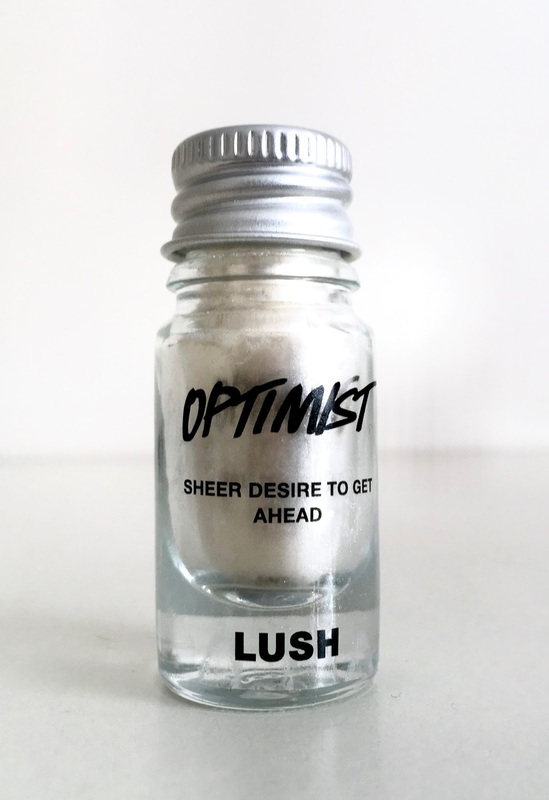 Despite my families better judgement I managed to convince them to let me go to the Oxford Street Lush shop. This was my first time here and wow, what an experience. There was so much to see and buy, I could've spent a lot longer in there than I did. Somehow I managed to restrain myself from buying loads of bath bombs, realistically they wouldn't have survived very well being squashing in the suitcase. So I limited myself to just buy some small bath oils. They are so cute and small (perfect for the suitcase, as long as they don't melt, and luckily they didn't) and the variety in the shop was massive. I also got one of the shop attendants to help me find this amazing highlighter (eye powder). There was so many options she showed me to use as highlighter but I opted for this shimmery slightly golden eye powder to use as a highlighter for nights out, and it works brilliantly. A place I have been before is Boots. But I can never get used to the amazing variety of brands and products available. It would take you days to looks at every product in those shops, and I wish I could have. But with the minimal time, and nagging parents, I could only skim through the shop and pick out the bits that caught my eye. After searching for a long time, through many shops, I finally managed to find a peel off clay mask. 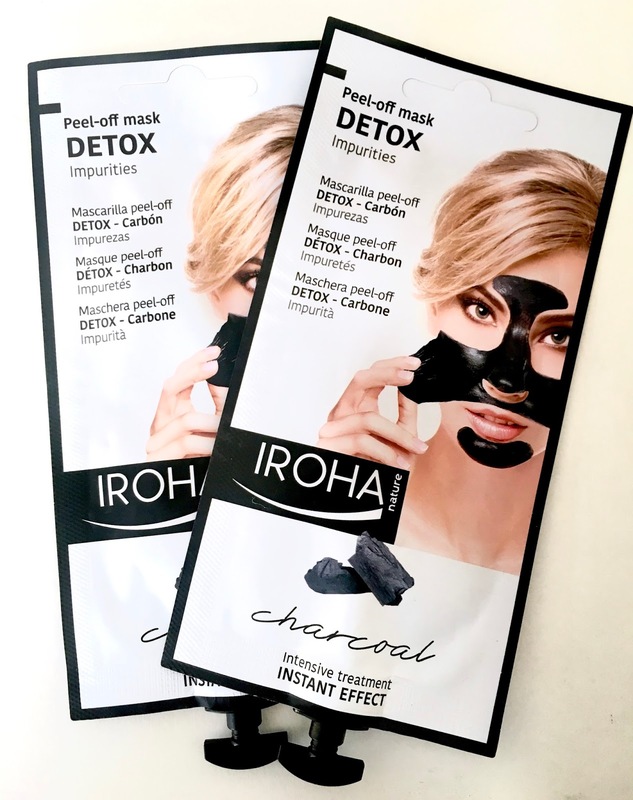 I have heard amazing things about this type of mask and have been wanting to find one to try it out for ages. Of course they don't have it anywhere in Australia, but I was lucky enough to stock up on some from Boots. Also after hearing people raving about it and searching for it in Australia for ages I also picked up the Pixi Glow Tonic. I can finally tell you, the stories are true, it is an amazing product and I highly recommend it. 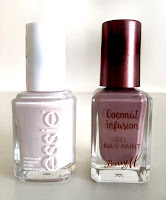 I lastly picked up a couple of beautiful nail polish colours. I cloudy, grey-purple colour by Barry M Coconut Infusion range called 'Paradise', and very light pink-white colour by Essie called 'Urban Jungle'. I am one of those rare individuals now days that loves to read. Unfortunately back here in Australia I rarely get the chance with university, the internet and other distractions. But on holiday I was away from lots of these distractions and got really into a lot of books in the small amounts of down time I had at night and during flights. I love a drama/romance book and read 'All The Bright Places' by Jennifer Niven. It is one of my all time favourite books I have ever read. 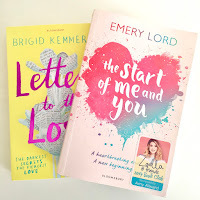 I also bought a couple more books to bring back to Australia hoping that I will at some point get some time to read them. 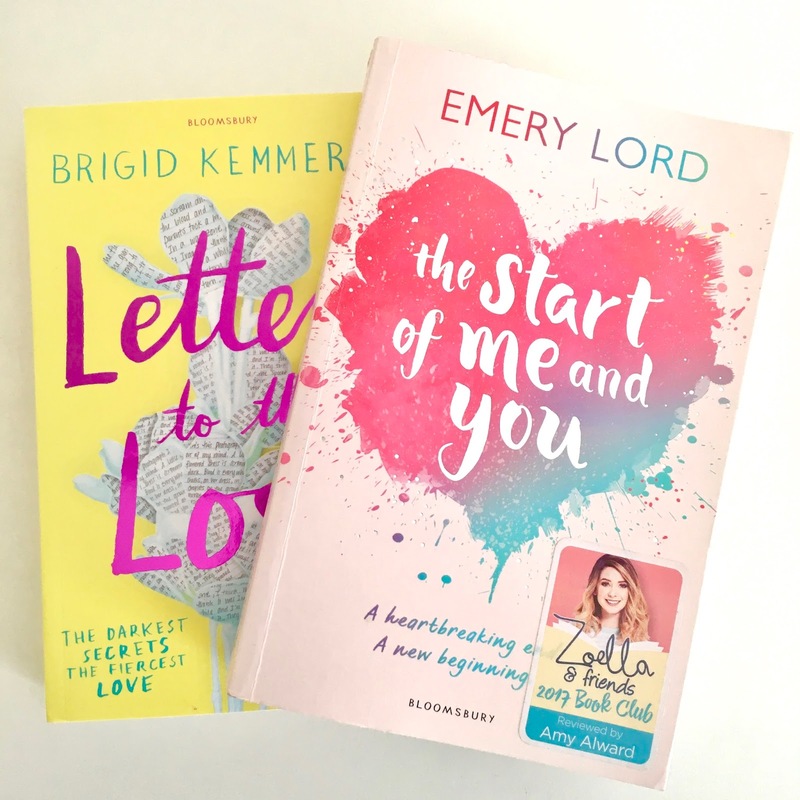 I noticed that these types of books were so easy to find and purchase in the UK after really struggling to find a decent book I was interested in to buy and bring on holiday. It took me four shops to eventually find All The Bright Places, that's a bit excessive, but maybe i was just looking in 'all the wrong places'. I hope you enjoyed another one of my blog posts. I'd love to hear your thought about the things I've talked about in it or anything you'd like me to blog about. When the weather gets cold, wet and miserable life seems to become so much harder to enjoy. Winter is always a struggle to get through for me. I hate the cold and the weather is always reflected by my mood. When there isn't the warmth of the sun to enjoy and your stuck inside most of the time, you have to make a real effort to find things to enjoy the winter months. 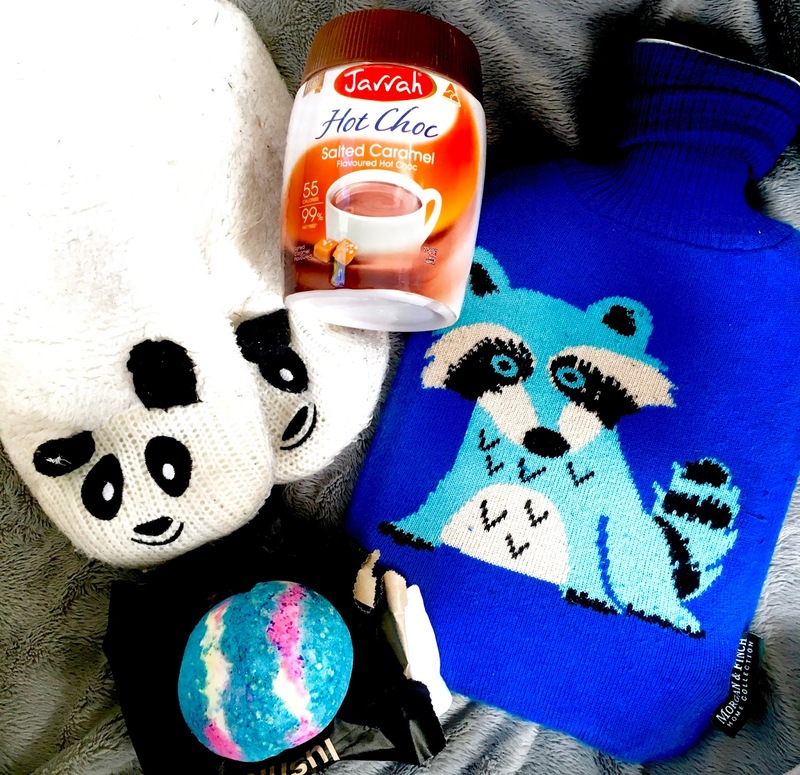 Without my winter essential, I don't know how I would get through the cold weather. Every year when it gets to June/July my winter essentials start to find there way back out from the back of cupboard and drawers, and becoming attached to my hip until the weather eventually starts to warm up again. Cosy Socks & Dressing Gowns - (I have mentioned my love for cosy socks many times before but here I go again, just incase you haven't got the memo yet, I love cosy socks! Walking around a cold house with bare feet (especially on tiles) in the absolute worst. I have quite bad circulation in my feet so they are always cold, even in the summer, so you can imagine how cold they get in the winter. Wrapping up you little toes in a soft woollen sock to protect them from the harsh outside world. Hot Water Bottle - Perfect to warm up you bed before you get into it. I know there is all this new technology with self-heating blankets and what not, but sometimes nothing beats an old classic. Laying your feet on a hot water bottle at the end of your bed surrounded by cool sheets. 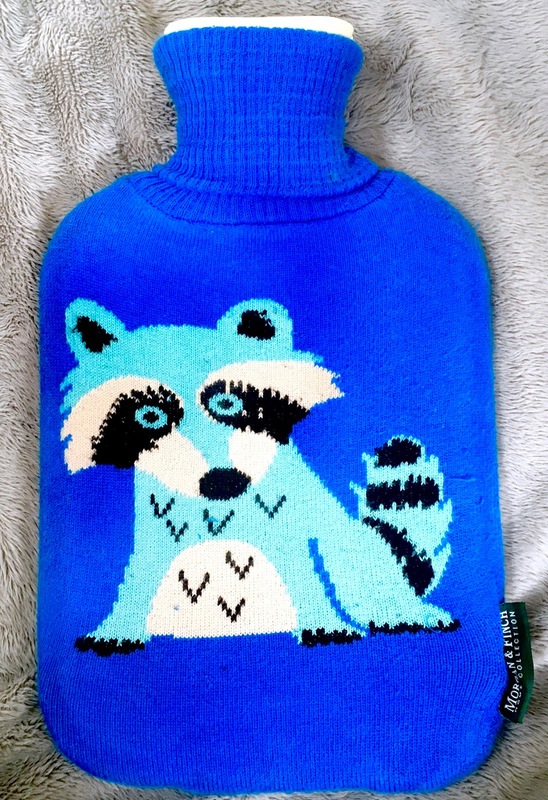 Plus you can get such cute covers for them, I love my raccoon! Fires & Heaters - My house gets so cold in the winter. Sometimes even outside is warmer than inside out house. Thank god for heaters and fires! 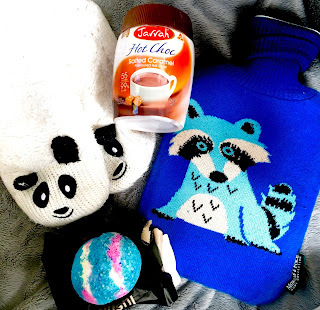 Hot Chocolate - There is not much else I drink in the winter other than hot chocolate. It is my absolute favourite. I'm not a lover of coffee and tea, so I always opt for hot chocolate, but any warm drink is perfect to warm your body up from the inside out. I know its not very healthy but we need to treat ourselves to make us feel better about the cold weather. Baths - Even though it is absolutely freezing when you get out, whilst your in there its like a warm blanket covering your body with bubbles and swirls of colour from a bath bomb you plopped in previously... luxury. Does anyone else get that tingly feeling in your toes when they're cold and you first but them in the warm bath? 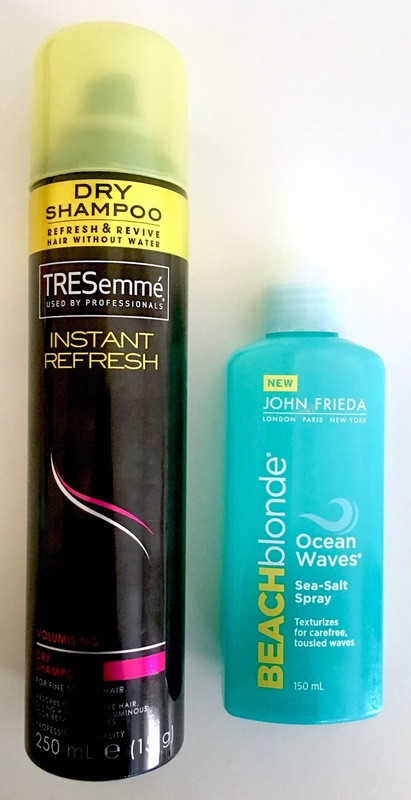 Hair Dryers - I don't tend to use hair dryers in the summer because I tend to get way too hot. But in the winter when you've got out of the bath or shower and your freezing cold and wet, blasting your hair with a hair drying is just luxury. And then once your done you left with toasty warm hair for en extra source of warmth. I hope this reminded you that there are some good things about winter that you can't really get in summer. But despite all these good things, I still hate winter. Although it is currently winter here in Australia, for a lot of you reading this it is currently summer. Summer means hot weather, blu skies, bikinis, bright days and tans... but equally means sweat, melting makeup and sunburn. So here are some of my tips to take minimise the bad (annoying) things about summer to make it even more enjoyable. Suncream - First and foremost, the most important part of skincare during the summer is to protect it against the harsh sun. No one like to get sunburnt and it isn't the most good looking trend either. But unfortunately the sun can have much more devastating effects, and we need to stop taking our chances against skin cancer. 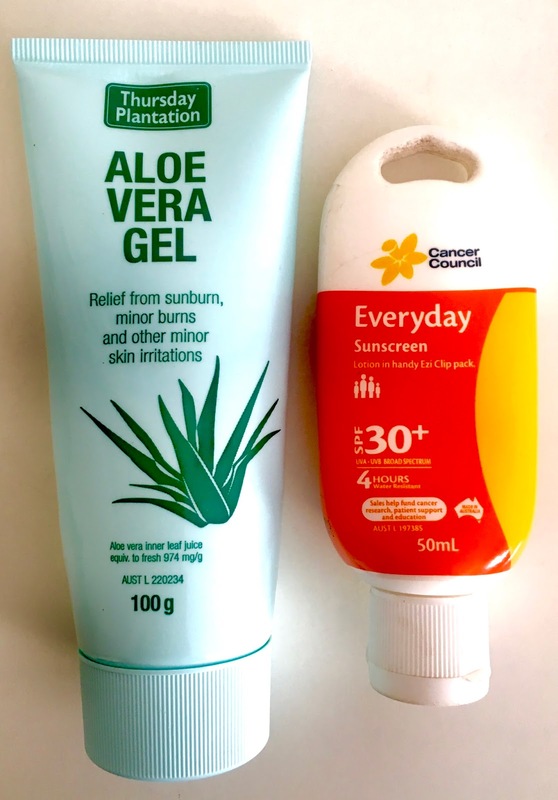 Even if the sun doesn't seem that strong it will always have an effect, so I can't stress enough to put on suncream before going out in the summer. I always use at least a 30+ suncream, the more protection the better. Sunburn relief - Unfortunately no matter how hard you try sometimes, you end up with sunburn. To provide relief from the pain and irritation I use Aloe Vera Gel. It is cooling, and really takes the edge off the pain. It is best to use all natural products on sunburns, without fragrance, artificial colouring, etc. You can find Aloe Vera Gel at most chemists or drug stores. But even better than buying it off the shelf is to access the raw, fresh stuff. I personally have an aloe vera plant in my garden, perfect for dry skin, burns, and cuts. Makeup Setting Spray - Now girls, I think most of us have experienced that time when we have gone out on a hot day with a full face of makeup on and out eyeshadow has ended up on our chin. I have found our saving grace. Makeup setting sprays help keep your makeup in place and reduce shine. You spray it on once you have applied your make up and as if by magic it works. There are a variety of setting sprays out there from cheap to quite expensive, and a variety of different focuses (matte, at nighter, cooling, etc.). I use a more expensive one from Urban Decay. I have used some cheaper setting sprays that leave small white dots on your face where it has been applied, but the one I use is very good and worth the money. Don't wear thick, heavy makeup - In the heat having makeup on is such a pain, when you sweat it all leaks down your face and ends up in a gross mess on your face. Summer is the worst time to wear makeup, when you sweat all the makeup is absorbed into your skin and can make it break out, and it also stops the sun from getting to your face to get that natural bronzed look. If you feel that you need to put makeup on try to opt for small amounts or light makeup such as BB creams. Deodorant - It's a known fact we all sweat, and summer is the worst time of the whole year for that fact. I like to have a bit of extra protection during the warmer months, which is why I recommend the Mitchum Clinical Gel deodorant. It is a gel formula, which means it is clear and doesn't leave white marks on your clothes, as well as being two times stronger than regular deodorants. It is just perfect for summer time. 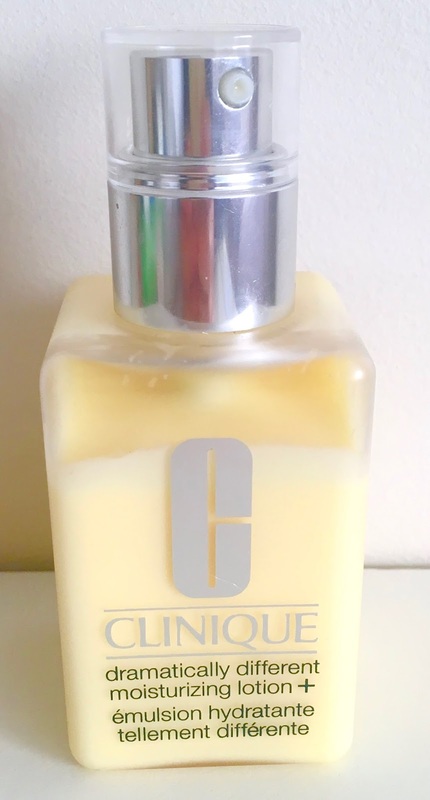 Natural Coconut Oil Moisturiser - I love to keep things really natural and gentle on my skin. I feel the sun gives it a pretty harsh beating for me to use strong products on top of that. That's why I like to use coconut oil. 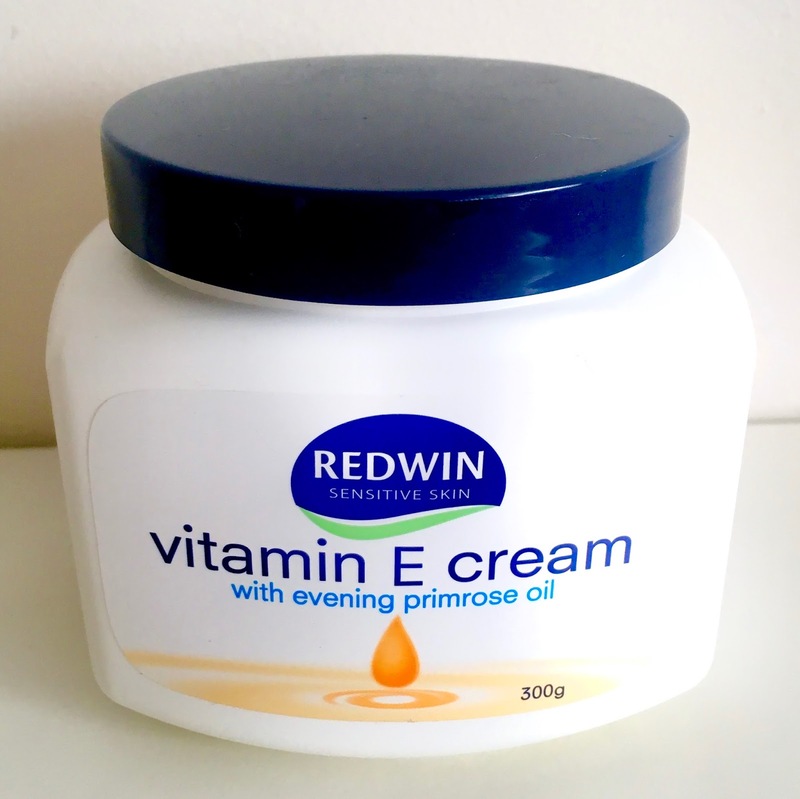 It is a great all over body moisturiser and can even be used as a hair oil to give it that extra summer glow. Lip Balm - My lips are dry all year round unfortunately. But when they are exposed to the sun for long amounts of time even I notice they become even dryer than before. I have tried many different lip balms and believe I have found one that is perfect (for me anyway). I have mentioned this before but I use the Lanolips 101 Ointment Multi-Balm. It is quite a thick and sticky liquid but is great for long lasting moisture. 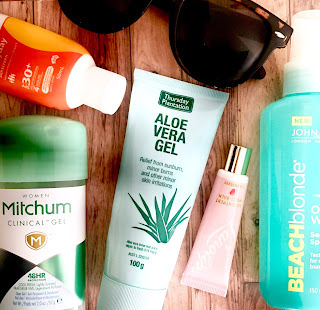 There are a huge variety of lip balms out there, some with sun protection which is perfect for the summer months for protection against the sun and others more focused on moisturising. But I think lip balm is almost as important as suncream and your lips are skin too, and believe sometimes they can be disregarded and forgotten about. I hope this provided you with some helpful summer tips and tricks. Enjoy the warm weather all of you in the northern hemisphere. I think we all find it really hard to get comfy and feel good on a long haul flight where you're confined to a really small space with recycled air and a limited supply of food/drink. Or serving food/drink whilst your sleeping or aren't hungry so you miss out, SO ANNOYING! 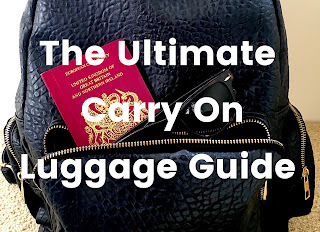 I thought I'd share with you some of my tips and tricks that I have picked up over the time I have been going on long hauls flights. Some of these tips may be a bit obvious but sometimes you need a bit of a reminder. Enjoy! Keep hydrated - I have always found this really hard to do on long haul flight. You only get a tiny cup of water with meals, I always find they taste funny (personal opinion), and when the flight attendants come around with drinks, again, they tend to only give you small cups or it is very tempting to ask for a sugary of caffeinated drink to boost your energy a bit as you have to ask the flight attendants for top up. I think it is a great idea to bring an empty water bottle in your hand luggage to fill up before getting on the flight to make it easier to hydrate. Although, when I do keep hydrated it means I have to keep getting up and down to go to the toilet and it can get very annoying. But despite that it is important. The airplane are really dehydrating and water is the best way to provide you body with essential hydration and can make you feel a whole lot better after the flight. It's worth it trust me! Take your shoes off - Keeping shoes on a whole flight can be very bad for your blood circulation, not only being really uncomfortable. I always wear one of my bulkiest shoes to the airport to free up some space in my suitcase and pack a pair of really comfy (and warm, keep in mind that the plane can get very cold) socks. As soon as I get onto the plane I take off my shoes and tuck the under the seat in front of my and slip into my cosy socks. It instantly makes me more relaxed and comfy which is brilliant for a very uncomfortable journey. You may be a bit worried about walking up the isle and going to the toilet in just socks, but believe me I have found majority of the people on long flights take off their shoes and hang around in their socks. And when its dark no one will be able to see them, and who looks at your feet during a flight anyway. Brush your teeth and re-apply deodorant during the half way stop off (of you have one) - It is always nice to have a bit of a freshen up during the time your waiting for the second half of your flight. After sitting in one spot for about 8 hours can make you feel really rough. Brushing your teeth and splashing your face with a bit of water makes a whole world of difference to feel more fresh and clean. It makes your feel so much better going into another long flight feeling clean. The first time I did this I was worried that I'd look a bit strange brushing my teeth in the toilets, but I was so wrong. Pretty much everyone who went into the toilets had their toothbrush in their hand ready for a freshen up. If your flight doesn't have a stop off I definitely recommend taking your toothbrush with you to the toilet on the plane to have a quick brush and freshen up. Wear comfy clothes - I always wear yoga pant (leggings), a big flowy shirt. Wearing comfy clothes helps your skin to breath and makes the flight more comfy and enjoyable, and also allows you to move into funny yoga positions attempting to get comfy in your seat (if you've been on a long haul flight you'll know what I'm talking about). I highly recommend layering! Planes can get really cold as they gain altitude and try and regulate the temperature. I always wear a singlet underneath my flowy shirt and a thick jumper, along with my cosy socks. Even if the plane doesn't turn out being too cold your are able to take layers off. I also like to wear a jumper with a hood to use it as a barrier and hide my face when I'm trying to sleep, it also blocks out some light f your not wearing a sleeping mask. 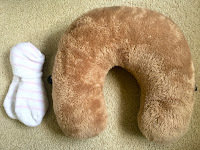 Bring a neck pillow - Allow a lot of long flight provide you with pillows they are second hand from people in previous flight and don't tend to get washed, along with not being very cushiony or comfy doesn't help. Although they can seem a like a pointless purchase I strongly disagree. It took me a while to finally purchase one but I'm so glad I did. They are great support for your neck and gives you something to lean on to make it a bit easier to get some sleep. However, my tip for using them is to wear them side ways or back to front around your neck as it is a lot more comfy and supportive than wearing them the normal way. In-flight skin care - This may not be one for everyone but personally my skin gets very dehydrated and dry on flights and can become quite uncomfortable. So I like to take small moisturiser and lip balm in my hand luggage to apply during the flight to try to avoid getting uncomfortable, dry skin. Bring wipes to freshen up - Occasionally you will find that flight attendants come around with cool wipes for you to use to freshen up your skin. Since I first discovered the miracle of cooling wipes on flight I have never left home without a small pack of them. Their great to use on your face, neck and arms to freshen up and make you feel more awake. I highly recommend this. Stand up and move around - Whether that's going to the toilet or just having a small walk up the isles, it is great to move around to loosen up your muscles and get your blood circulating around your body. Sitting down with minimal movement for a really long time is so bad for you blood circulation and can cause your muscles to tense up and ache. Just a walk up the plane isle can make you feel so much better and helps your blood get to places it may not be able to get to sitting down, such as your toes which can make your feet even colder. Try to sleep - This one is much easier said than done on a flight. It is so hard to get comfy and find a good position for your head, despite all the lights, noises and distractions around your but it is really important to get some sleep. Sleeping not only will help avoid jet lag but also helps you feel so much better on a flight and makes the trip go so much faster if your able to get a bit of shut eye. Even if you aren't able to get to sleep just sitting there for a bit (in your funny yoga position) with your eyes closed helps your body to rest and recover. A little tip if you are trying to sleep on a flight, don't eat or drink a sugary or caffeinated drink right before your planning to have a nap. Food and drinks give you energy and it doesn't make it any easier to sleep when you have just consumed high levels of sugar or caffeine which will keep you awake and buzzing for at least another good hour. I hope this helps some of you with surviving the dreaded long haul flight. If any of you have any tips I would love you to to share them in the comments below. Any extra bits of advice are helpful! The weather is getting colder, which means a major change in skin care regime is needed. As my body panics trying to make sense of what is going on with the temperature, my skin tends to get really dry in the winter. 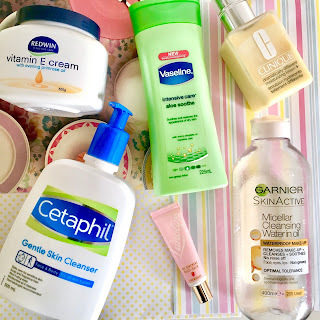 In attempt to combat the winter dryness I have been testing lots of products and have found my saving graces which have permanently joined the battle against my skin. I always try to be really gentle with my skin whilst its having problems. The last thing you want to do when your skin is freaking out is irritate it more with intense products with lots of chemicals. Especially when its dry, using products with harsh chemicals will strip away the natural oils on your skin which are trying to help with the dryness. 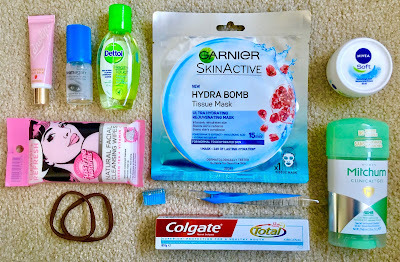 To remove makeup I have been using the Garnier Micellar Oil-Infused Cleaning Water. It is even easier to remove make up with the oil-infused water than the original version, removing water proof and long wearing makeup. It is great for dry and sensitive skin as it contains nourishing oils. 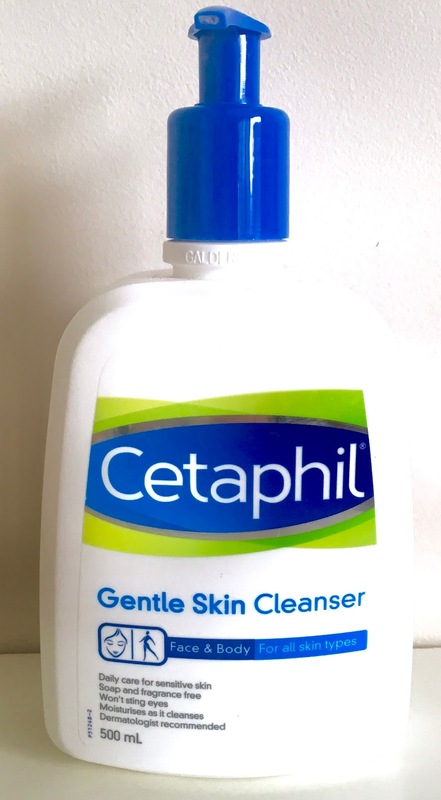 To wash my face, I use my trusty Cetaphil Gentle Skin Cleanser. It is really gentle on skin, free of soap which can strip your face of the natural oils, and moisturizes as it cleans, perfect for any skin type. To moisturise my face I have been using a combination of different moisturisers depending on the time of day and the intensity of moisture I need for my skin. First thing in the morning I use the Vaseline Intensive Care Aloe Smooth moisturiser. It is really light and quick at soaking in, which is great for before makeup application, but is probably the least moisturising. 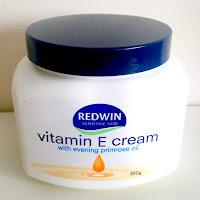 Throughout the day and in the afternoon after taking my makeup off I use the Redwin Vitamin E Cream. I have been using this moisturiser for years and always go back to it because it is really moisturising, light and soaks in quite quickly. At night I have been using the Clinique Dramatically Different Moisturising Lotion before applying spot cream. It is quite thick and isn't as quick as the others at soaking in which is why I use it at night time but it is a brilliant product for intense moisture. I think it is also really important to exfoliate your face about twice a week to remove any dried or flaky skin. 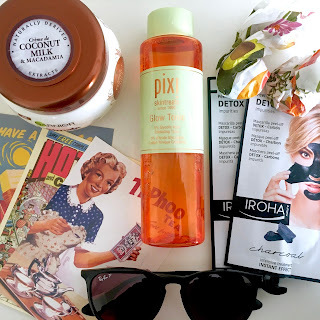 I have found that quite a few exfoliators can be really drying for your face, so it has taken me a while to find the perfect one. I like to exfoliate my face with an exfoliating face wash in the shower, as your face tends to get dry in the shower anyway with all the steam and you can come out fresh faced and beautiful. I am currently using the Biore Blemish Clearing Scrub. I have also been suffering with really dry lips. A natural way to solve this is to drink more water as dry lips can be a sign of dehydration. But I also find using a lip balm helps a lot as well. I have experimented with many lip balms but for me the Lanolips 101 ointment multi-balm stood out from all the rest. It is quite a thick and sticky liquid which may put a lot of you off this product but it is amazing for extremely dry lips and in my experience has rehydrated my lips in only 2 days of using it. I hope this blog post help any of you out there that experience, like me, the dreaded winter dry skin. Please comment below with your tips or favourite products for dry skin. I am lucky enough to be going travelling this winter to the UK. Extremely over excited I started organising and putting out things really for the trip a whole month before I leave, and have made numerous lists (one of my all time favourite things in the world to do is make lists) of what I need to bring. I thought I would share my excitement with you by presenting my 'ultimate flight carry on bag guide'! 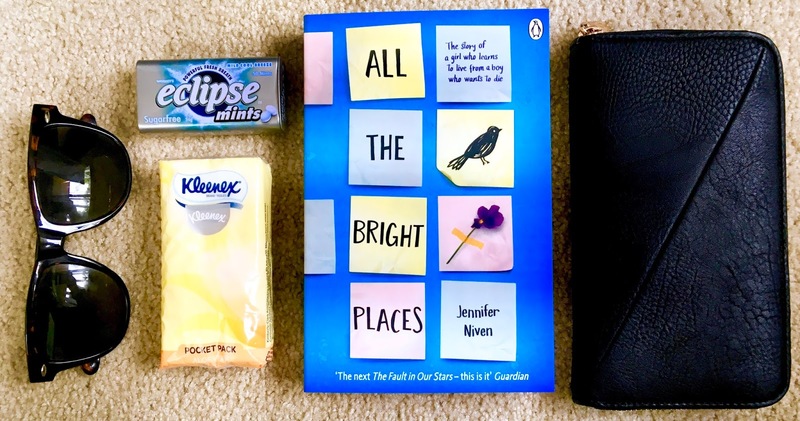 My travel bag is always equipped with necessities, along with various comfort items to attempt to make long haul flights just that little bit less horrific. First and foremost, the bag. This trip I am taking my absolutely favourite bag at the moment that I use for EVERYTHING. It's a medium sized, foe leather backpack with gold zips. I bought it from SportsGirl quite a few years ago, so it is very unlikely to still be available. But I have seen similar bags everywhere at the moment, so it shouldn't be too hard to find one. I am taking my phone and my laptop with me. I always make sure I pack my electrical devices in my carry on to make sure they are with me at all times in case I need them on the flight, and the main luggage tends to get thrown around a lot or could get lost. I also bring my chargers and cases for extra protection. I am also bringing headphones to watch movies on the plane. The earphones they give you on the plane tend to be second hand so I prefer to take my own. 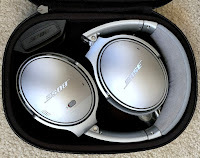 I use the Bose headphone, they come with a protective case and a airplane cord, so their perfect for flights. Even if I don't want to watch a movie, they are noise cancelling, so they will dull down the noise of the airplane and surrounding if I want a bit of piece and quiet. I also find my headphones really comfy as they don't sit on top of your ears like a lot of headphones do, but surround them. I highly recommend them. The plane is always such a dry atmosphere, so I always make sure to bring a variety of moisturising skin care products. I always make sure I including a small tub of moisturiser and lip balm. I also love to use a sheet face mask on plane flights for some intense hydration. Even though I can get some funny looks its great in the long run. 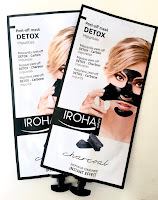 Sheet face masks are great for flight as you don't have to wash it off, you just throw it away once you've finished. I will be using the new Garnier Skin Active Hydra Bomb face mask. Because of how dry the plane is my eyes tend to get extremely dry, so I pack an eye mist. It makes me feel a hundred times better. 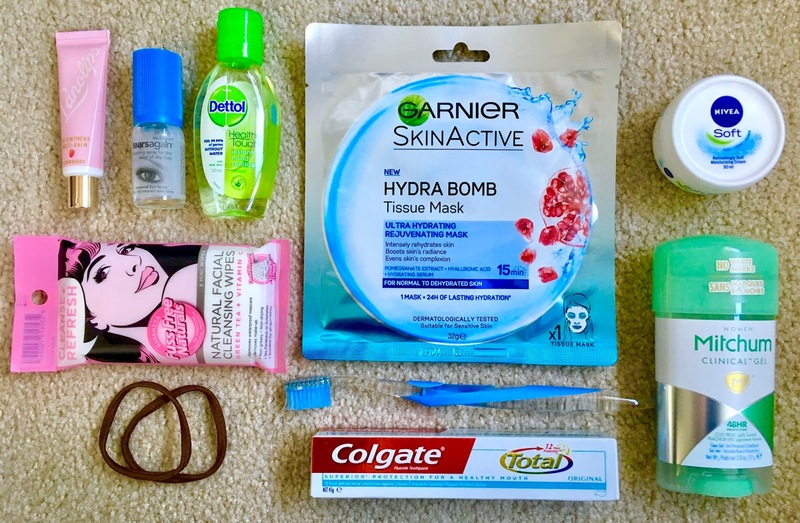 I also like to pack face wipes to freshen up my face during the flight, deodorant (no body likes to sit next to that person who smells), a toothbrush and small toothpaste to freshen up my breath during the stop off, and some hairbands to tie my hair up to get it out of my face. Make sure when your bringing liquids onto the plane to check the liquid allowance. And pack your liquid in a see through case so they can be easily checked when going through security. For long flights I always bring a pair of comfy socks and a neck pillow to add some comfort to a quite uncomfortable trip. Although on many long flights they provide you with pillows they tend to be second hand and unwashed, I'd much rather bring my own in my opinion and its so much more comfortable. Reading helps pass the time and relax you a bit more than watching a film if you want to sleep. I love to bring a new book and occasionally a magazine. Even if where your coming from is gloomy and dull I always take my sunglasses in my hand luggage just in case when I get to my destination it is sunny. I always like to have fresh breath during a flight to make me feel more fresh before I am able to get somewhere to brush my teeth. I love the eclipse mints, they are quite intense and great for freshness. Tissues are always a must just in case or if you need to clean up during the flight. Make sure you keep all your valuables in your carry on bag rather than your luggage to keep them with you at all times in case something happens to your luggage. 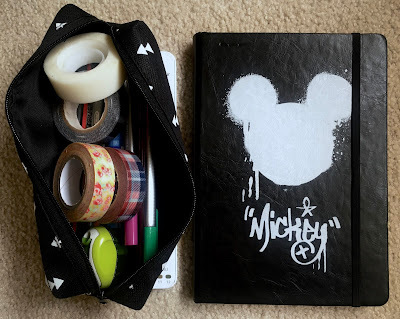 I'm planning on making a travel scrapbook of my trip as a project whilst I'm out there, so I am bringing a journal and a variety of stationary with me. Please let me know if there is anything I am missing, or other things you like to bring in your carry on travel bag. I hope you enjoyed to post. Welcome to my blog! I am basically your average young adult wanting a little bit more out of life, and this is where it has lead me. I blog about anything & everything that catches me attention from beauty to lifestyle, travel, advice & food. ENJOY! All content copyright SweetBlur unless otherwise noted. Simple theme. Powered by Blogger.